I first met the Lavertys – Colin and Liz – in 1995, at the peak of their collecting days. It happened in Warrmun, the painting heart of the East Kimberley. Was it also the peak of the industry as we sorted through the canvases in the house run by Warmun Traditional Artists to find the latest masterpieces from Rover Thomas, Queenie Mackenzie, Jack Britten, Freddy Timms, George Mung Mung, Hector Jandany, etc – who painted in the cool beneath the house and all of whom were still alive? It was my first field trip with that inveterate promoter of the industry, Helen Read's Didgeri Air Art Tours. The Lavertys had been in the field since 1991, just three years after they'd had their Damascene moment at the Brisbane World Expo – a first excited sighting of Papunya art on exhibition. Despite our differences in experience and wealth – Dr Colin Laverty had sold out of Laverty Pathology, the company he'd established after a scientific career in which he'd identified the human papilloma virus, leading eventually to the development of a vaccine against cervical cancer - I particularly recall being miffed at their eager purchase of a $5000 Rover canvas that I'd been looking longingly at! Those were the days! Now it would be hard to buy a Rover under $50,000, especially if it were to have the credibility of coming from the Laverty Collection, almost certainly the best Indigenous art collection in Australia.161 works will have done just that when Deutscher & Hackett undertake the 'Beyond Sacred' sale at the MCA in Sydney on March 8th. 'Beyond Sacred' was, of course, the title of the book (in two editions) that the Lavertys first published in 2008 to promote both the art and their more political view that too many people still dismissed Aboriginal art as folk art or ethnography rather than as work that, while almost certainly having a sacred intent in the artist's mind, could be received as absolutely contemporary art by any non-Indigenous buyer. Essays by Nick Waterlow, Howard Morphy and Judith Ryan all supported this view, and there were also significant regional and artist profiles by those most closely involved. Some of these reappear in the D&H catalogue; but replacement essays seem only there to boost the art for sale. It should be made clear that this is not an auction of all of the art that was featured in the two editions of the 'Beyond Sacred' book. There were 350 works in all in those two books. And some had already been sold by Bonhams in 2013 – just after Col sadly died. That was an auction with a mixture of Aboriginal and non-Indigenous art – for the Lavertys had always favoured the more daring non-figurative works of artists like Larter, Whisson, Tuckson, Tomescu and Upward even before adding Aboriginal to the mix. Arguably, therefore, it went further in promoting their 'Beyond Sacred' argument than this D&H auction does, being exclusively Aboriginal. So in 2013 they sold my favourite work from 'Beyond Sacred' – Sunfly Tjampitjin's 'Men's Law at Murunpa' for almost $80,000. 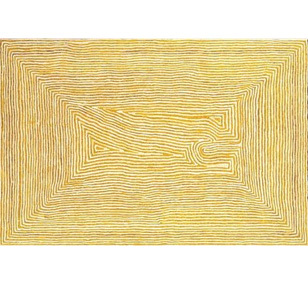 This 1991 painting from Balgo was eye-catching in English eyes too – it had featured on the London posters for the big Aratjara exhibition there in 1993 which went on to tour Europe. Balgo meant a lot to the Lavertys, with Col writing his own essay on its art history in the books. Bonhams made a big effort with that sale. 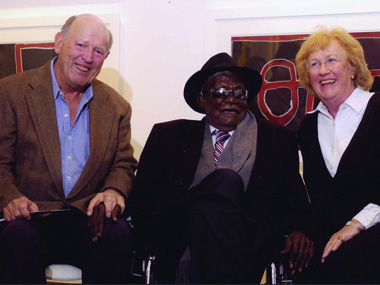 Artworks were toured internationally, and the publicity surrounding both the sale and its success in terms of clearing 86% of 266 works and raising over $5 million (including buyers' premium) was a huge fillip for a section of the artworld still in the doldrums from the GFC and the precipitate exit of naked investors that followed it. But, though the sale will once again be at the MCA, Bonhams is not favoured this time. Why would Liz Laverty now want to sell some of her finest Paddy Bedfords, Alma Webous, Butcher Cherels, John Mawurndjuls, Tjumpo Tjapanangkas, etc? 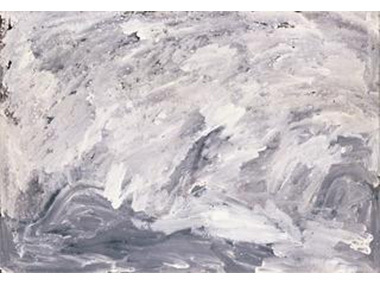 Or such a unique work as Lorna Fencer's powerful 'Grief', a grey wash, Abstract Expressionistic work painted in response to a family tragedy? These are complex matters for a widow with commitments to educate her grandchildren and the costs of storage never diminishing. Philosophically, she and Colin wanted their Collection seen – many have been loaned to exhibitions, many have been donated to public institutions. The exhibitions seen at the Newcastle Gallery in association with the 'Beyond Sacred' books' publications played a major part in increasing demand for Indigenous art in that city. “So it's such a waste to keep them in storage”, Liz insisted; “but I have to until Colin's Will is settled”. Interestingly, though, Liz revealed that she'd decided that this time the market couldn't have her favourite non-Indigenous works yet. “They're the stand-outs in the house in my life. I still come home every day and think to myself, “Wow! Isn't this fantastic. The pleasure hasn't passed”. It's perhaps not surprising that Liz is as engaged by art as was Colin. For the D&H catalogue carries an introduction by Ron Ramsey (formerly of Newcastle Gallery) revealing that her ancestry lies with James Cuming, an entrepreneur in fertilisers and chemicals, who partnered with fellow Victorians, Messers Felton and Grimwade to make their fortunes fortunes, much of which went into supporting the arts at the end of the last century. She therefore had Heidelberg connections and grew up alongside two significant McCubbin canvases. What on earth would McCubbin have made of Walangkura Napanangka? Could he possibly have opened himself up to becoming friends with so many of the 426 Aboriginal artists that found their way into the Collection, as the Lavertys did? They have certainly proved themselves more adaptable than I suspect any of those Heidelberg heroes could have been. As the late, great Faith Bandler is quoted as saying, “The hardest part of the 1967 Referendum was to get people to think of the Aboriginal people as people”. The Lavertys had no problems, as is attested by Bidyadanga artist Daniel Walbidi's letter to Liz after Colin died: “It's through the hard work and dedication of people such as yourselves that the Aboriginal culture has and will continue to survive”. And Liz repaid him by falling to the temptation of buying his painting, 'Wirnpa & Sons' which ran away with last August's General Painting prize in the NATSIAAs, “even though I'm really trying to resist anything that adds to the Collection”. The 'Beyond Sacred' artworks can be in seen in Melbourne until Sunday 22 February; and they go on show in Sydney on Thursday 26 February - both at Deutscher & Hackett galleries. The sale will be held at the MCA in Sydney on Sunday March 8 at 2.30pm.